Date : Antwerp ca. 1603-1612. Size : 13.8 x 18.9 inches. / 35.0 x 48.0 cm. 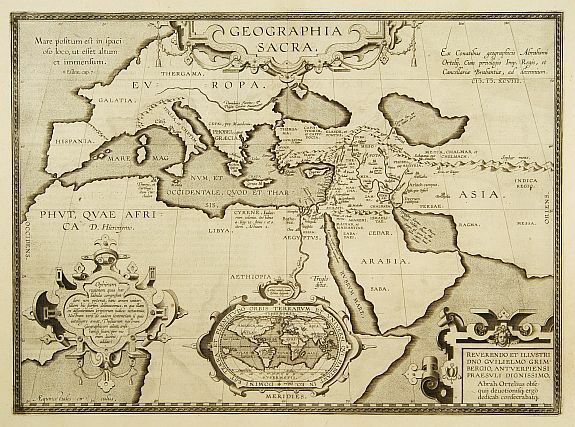 Description :This map of Sacred Geography is based on holy writers in the Old and the New Testament, following the translation of the Septuaginta. For details, the reader is referred to other Parergon maps, notably the travels of Abraham and St. Paul. Shows the Holy Land in detail and the continents of Europe, Asia and Africa surrounding it. At bottom centre, oval inset: Orbis Terrarum, a much reduced version of Ortelius' world map in his Theatrum.. Latin text on verso. Condition : A good and dark impression.